This is something we often cook on a Monday if we’re fortunate enough to have leftovers from the day before. We often do have leftovers because we generally buy a larger piece of meat than we need – it makes for a quick and easy meal on a Monday night and I think the larger the joint of meat, the less chance there is of it drying out on the day of roasting. There’s a few posts on this particularly leftover dish so I won’t go into much detail (you can find the method for the chilli sauce that the pork is reheated in here) but we have altered our bean recipe so I wanted to record that. We’ve been making these beans for a while and really like them, the original recipe is a real faff though so we’ve been playing with it to see if we can simplify it without losing any of the flavour. This is much simpler and is a really versatile recipe that works well in wraps or as an accompaniment to other Mexican dishes. It freezes well too. Put the beans into a pot, add cold water to cover. Add half the chopped onion, half the garlic, the bay leaf and the chillies. Bring to the boil, reduce the heat, cover and cook until the beans are tender. The cooking time will vary depending on the beans and whether you’ve soaked them or not. Allow two hours but check regularly and top up with water if necessary. You want the water to have almost completely evaporated by the time you’ve finished this stage but you can drain the beans if you need to. I usually do this the night before I need the beans and refrigerate them at this stage, completing the next step on the following day. About 20-30 minutes before the beans are cooked, heat some oil in a frying pan and soften the remaining onion and garlic. Add the tinned tomatoes and cook for about five minutes. Add a quarter of the cooked (and drained) beans into the frying pan and mash. Stir in the remaining beans, mix, season with salt and then serve. 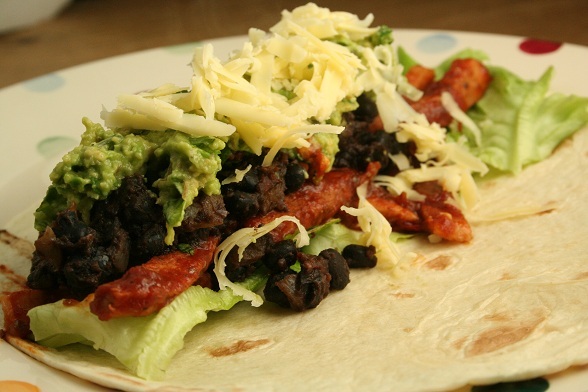 Subscribe to comments with RSS	or TrackBack to 'Leftover Pork Wraps with Refried Beans'. Luckily for me we had leftovers of the leftovers so I have some for lunch today! But we had eaten all the wraps, so don’t have any of those.